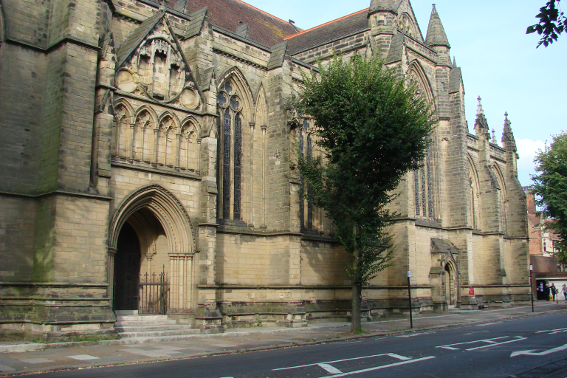 The parish church of Hove, St Andrew, was in effect rebuilt in 1833, but by 1880 there was a move to build a new and more worthy one for the town which had continued to grow. The Rev Thomas Peacey of St Barnabas was instrumental and a site was given (Sawyer II p330). 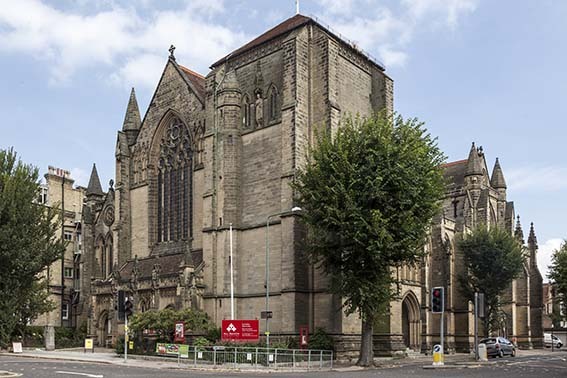 J L Pearson was already engaged to build that church and received the further commission (ibid p331) without any consultation, according to Somers Clarke junior‘s much later recollection (AR 45 p86). Pearson’s plans for a vaulted church were rejected as insufficiently spacious and Somers Clarke claimed he then persuaded Pearson to make new designs, although he himself had been asked to produce some. Meanwhile, a start was made on the vicarage, built to Pearson’s plans in 1882-83 (Dale p256), but his revised ones for the church were not completed until 1887 and construction started two years later. The magnificent drawings, signed by the architect, have happily been preserved (ESRO Par 387/10/183 etc). The result is said to be Pearson’s largest parish church. Though the intended south west tower remains a stump, it is also one of his most imposing, with much carefully thought out detail, like the niches on the buttresses on the south side. 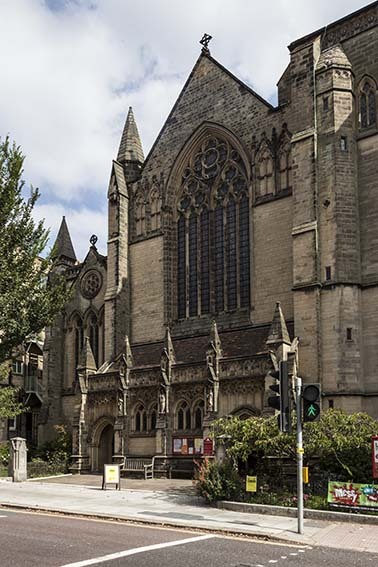 Built of dark sandstone from Worth (B 81 p322), the nave, aisles and short transepts were taken into use in 1891. 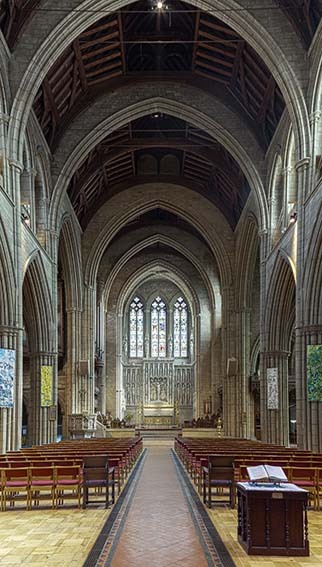 Across the nave are transverse arches with wooden roofs between and the aisles are similarly roofed; it is not immediately apparent that the north aisle is narrower than the other. The transverse arches allowed the semblance of a vault in a nave that was too broad for one. Though the initial effect of the interior is of great richness, Pearson achieves this economically, using only shafting and conventional mouldings. The detail is Geometrical, but unusually for Pearson his tower would have had a flat top with pinnacles like a Somerset church, not a spire (BN 74 p9). After Pearson’s death, his son F L Pearson completed the eastern parts without change in 1901 (Quiney p257), by which time over £40,000 had been spent (B 81 ibid). The chancel is in two parts becoming progressively narrower. The narrower square sanctuary is vaulted, with a square east end, flanked by tall pinnacles outside, instead of Pearson’s frequently preferred apse. Here, only the south chapel has an apse and is vaulted throughout. 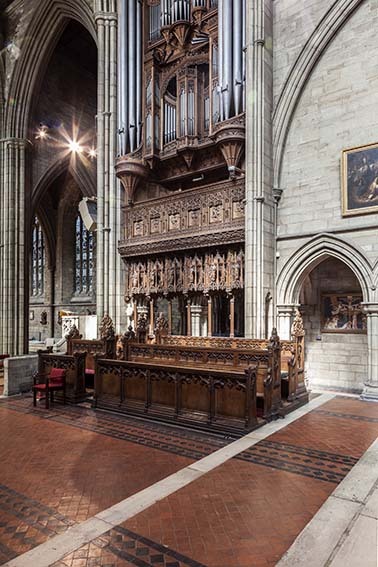 His ability to create an opulent effect by simple means is as evident here as in the nave. He or F L Pearson designed most fittings (see below), some highly elaborate. In a smaller church they might be oppressive, but here the match the scale of the architecture. The vaulted narthex at the west end was added in 1924 (VCH 7 p267). At the same time a start was made on the tower and the stone panelling on the narthex departs from the body of the church in style. However, one was intended from the start (ESRO Par 387/10/183/9). Font: Heptagonal, with detail of green and red marble. Font cover: Tall and open, traceried and crocketed; E Ormerod, 1928 (Antram and Morrice p56). 1. Most glass was designed under Pearson’s supervision by Clement Bell and made by Clayton and Bell between 1891 and 1931 (ESRO Par 387/10/99). 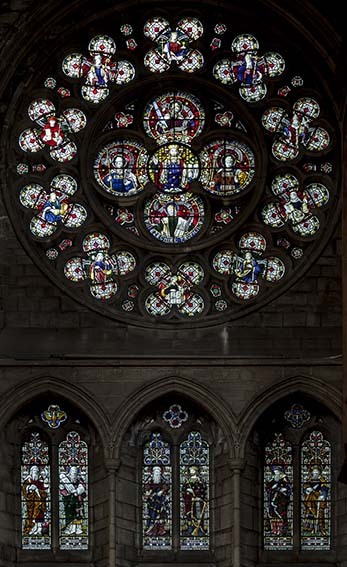 Though not the company’s finest work, the colouring is well matched to the location; the south west window of the south aisle was designed by R O Bell in 1926 (BE(E) p240). 2. (South chapel and porch) Four windows (in chapel) (in memory of Canon Peacey and his wife) and two in the porch by M Travers 1931-32 (CDG June 1931 p255 and Warrener and Yelton p322). 3. 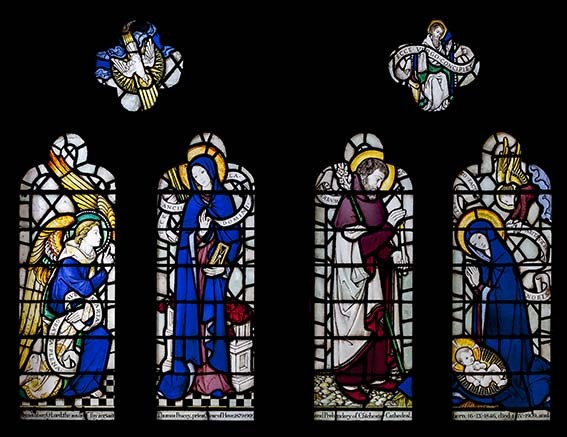 (East window and others) M C F Bell of Clayton and Bell, 1935 (DSGW 1958). Organ case: By F L Pearson. 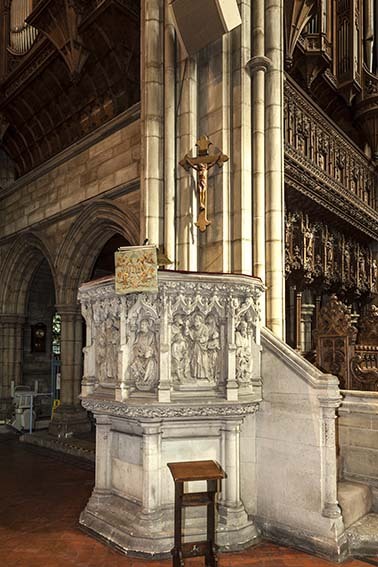 Pulpit: Elaborately carved stone and probably by N Hitch who did so many of the fittings (see below for those that are documented). 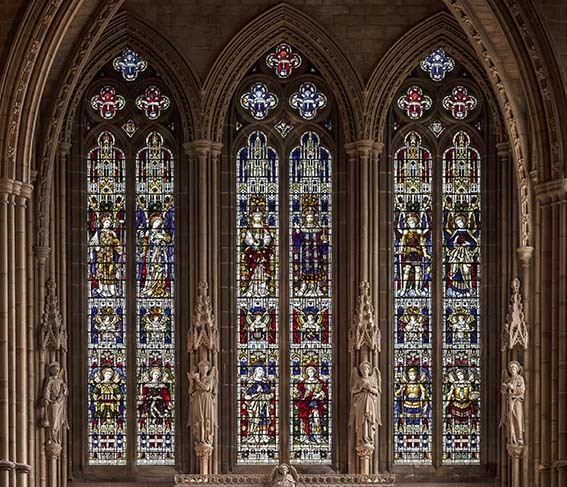 Reredos: Tall and carved and centred on a representation of the Crucified Christ. It was carved by N Hitch (www.BritishListedBuildings.co.uk), as probably was much of the other carved work in the church – see below for the throne and sedilia etc, which certainly were. 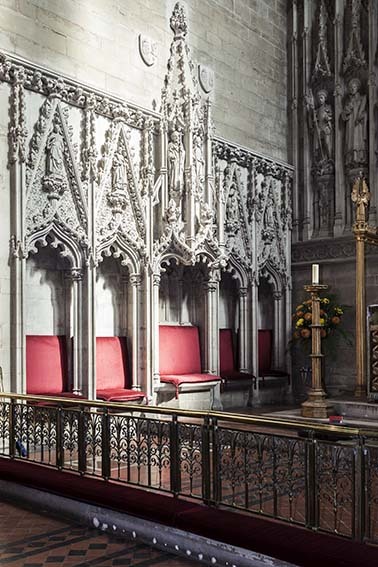 Screens: (to south chapel) Wooden side screens, dating from after World War I.
Sedilia and Bishop’s throne: 1902. They are on both sides of the chancel and being in C14 style, with ogee-heads, they do not match the style of the rest of the church. However, they are very fine and related to the reredos. There are figures of eminent contemporaries, including Queen Victoria. They were designed by F L Pearson, the carving is by Hitch. Statue: (East end, north aisle) The Risen Christ by F Stephens, c1960 (BE(E) ibid). It is likely that this was made either by Faith Craft (of which Stephens was chief designer) or in the South Tyrol on their behalf (personal communication from Fr Stephen Keeble). My thanks to Nick Wiseman for all the photographs except that of the south side.